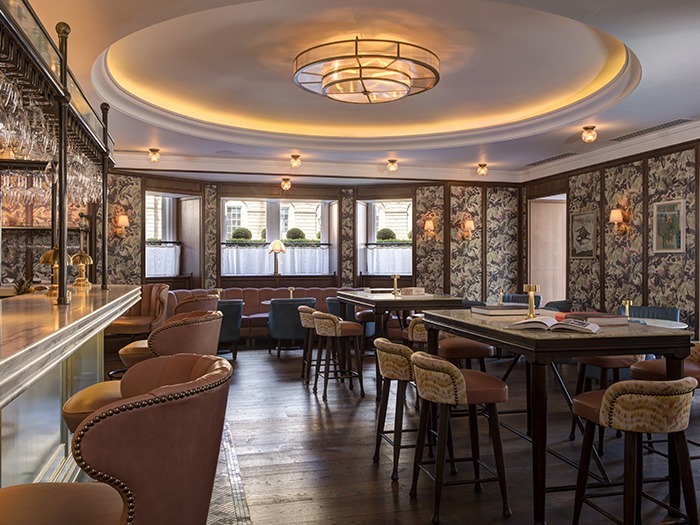 Brasserie Prince, inside Edinburgh’s famous Balmoral Hotel, was designed by Martin Brudnizki Design Stidio with lighting from Dernier & Hamlyn. This restaurant signifies an alliance between the Forte family and legendary father and son chefs Michel and Alain Roux. It is a classic eatery inspired by the French Bistro scene and is the design studio’s first foray into Scotland. Its menu offers classic French dishes made with the finest Scottish ingredients. Brasserie Prince comprises a restaurant, lounge and bar. It has a striped coffered ceiling, high-gloss lacquer, timber panelled walls, traditional banquettes and room-length mirrors. The dining space is flushed with soft blues, green and blush pink. Natural timber, soft leather and mohair wool have been integrated to reflect the rich history of the building. The lighting was designed to flood the room with subtle light and cleverly combines understated glamour with stunning design. This can be seen with the two-tier chandelier, almost 1.5m across, made in London by bespoke lighting manufacturers Dernier & Hamlyn. Finished by hand in antique brass and fitted with ribbed, curved translucent panels, the unusual light fitting was the result of close collaboration between Martin Brudnizki’s team and Dernier & Hamlyn. This partnership ensured that the aesthetic requirements were met and that this unique chandelier was manufactured using materials that were practical to maintain and meet the designers’ visual and budgetary needs. Martin Brudnizki has commissioned Dernier & Hamlyn for a range of projects previously such as Jamie’s Italian and Scarfe’s Bar.